Officials of the Bureau of National Investigations (BNI) acting on the instructions of the Government of Ghana last Wednesday arrested, hand cuffed and detained Prince Prah, Editor of DAYBREAK newspaper, after the paper carried a story that it had received reports that the Chief of Defence Staff (CDS), Lt. Gen. P.A Blay, would soon be relieved of his post. The Government of Ghana, speaking through Deputy Information Minister Samuel Okudzeto Ablakwa, has justified the arrest and detention claiming it was necessary because DAYBREAK has been fond of publishing stories concerning the Ghana Armed Forces. We believe we owe Ghanaians and our readers, a duty to explain why we carry stories on the GAF and state for the records that the BNI cannot gag us from free speech and our constitutionally mandated media rights as long as we do so within the laws of Ghana. DAYBREAK believes in protecting the professionalism, sanity, sanctity and dignity of the Ghana Armed Forces (GAF) and that has been our prime goal in publishing stories about the military. We also believe that the GAF, or no other group of Ghanaians, is not above the Constitution of Ghana and we shall at all times ensure this remains so. It is for this reason that when we have cause to believe that the mode of enlisting recruits into the GAF is being done in a way that undermines the professionalism, sanity, sanctity and dignity GAF, we shall not hesitate in raising red flags and sounding an alarm. This explains why DAYBREAK since November 2010 has serialized one publication after another concerning some sixty seven (67) persons who were illegally enlisted and smuggled into the GAF though they FAILED the recruitment processes. An official GAF documents signed by Col (Rtd.) JKT Caesar on July 10 2010 under the reference GHQ/2034/801/RECS said the said persons had questionable documents and ages. They were found to have also failed their entrance examinations. When DAYBREAK broke the story, the GAF could not deny, completely ignored the publication and yet went ahead to illegally enlist the 67 illegal recruits. DAYBREAK has also published several stories that the constitutional provision that calls for a regional balance in the recruitment and enlistment of Officers and Men is not been respected by the GAF. Indeed, this same issue took center stage on the floor of Parliament on Wednesday November 10, 2010 where the Minority provided documents to prove to the Minister for Defense, Lieutenant General Joseph Henry Smith that indeed the GAF and government gave preferential treatment to people of a particular region in the 2009/2010 recruitment. Certainly DAYBREAK was not publishing this story for the purpose of mischief but with all good intent and purpose in the name of the constitution of Ghana. Again when DAYBREAK broke the story of a young Ghanaian soldier, Lance Corporal Bright Annor Apeadu of the Recce Regiment of the GAF died under mysterious circumstances while on guard at the residence of the CDS on Friday 29th October 2010 at the Juba Villas residence of the Chief of Defense , the paper was not acting in mischief. The GAF remained silent on the matter and if not for the paper’s publication, Ghanaians would not have heard of that incident. We believe the current government and some persons in the GAF have been uncomfortable about DAYBREAK accurate but unfavorable stories about the military and only used the story about the speculated dismissal of the CDS to get back at the paper. For the records, DAYBREAK has not stated that it has seen a letter signed by anyone to relieve the CDS. Neither did we say the CDS has received any letter. What we said is that we have picked signals that the CDS is to be retired very soon via a release signed by the secretary to the President. We are a poor newspaper and cannot prevent government spokespersons from interpreting or misinterpreting what we published for reasons best known to them. Interestingly, when the Office of the President wrote a rejoinder on our publication on the CDS, DAYBREAK was not and has still not being served a copy of a rejoinder to a story the paper broke. DAYBREAK would want to state categorically that we are committed to the ethics of journalism and when we err, we would not hesitate to retract and apologize because we know journalists are not above the law. What we are yet to confirm is who authorized the BNI to do what they did. If it was done in the interest of National Security then we suggest the National Security Adviser, Brigadier-General Nunoo Mensah (rtd) deserves a sack unless he starts to advice his security agencies to act professionally and respect basic human rights. Indeed, this same Nunoo Mensah himself has repeatedly stated publicly that the GAF is been destroyed by ethnicity and partisan politics. 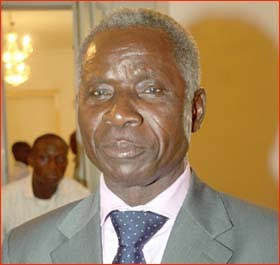 He has been quoted be the Daily Graphic of March 31, 2009 in a story written by Albert K. Salia under the headline “Security Services urged to live above Partisan Politics”, and published on page 16 of the paper. Finally we repeat that we refuse to be gagged by the BNI or whoever authorized them to do what they did on Wednesday March 16, 2011 against the DAYBREAK newspaper.